Things are slowly happening and I hope to be sharing on my experience with the dividend growth investing I am experimenting with soon. As for today, I am looking at my mortgage pay up and how I went from being against paying up my mortgage to being excited about paying it up in 2 years a year ago. You may see the figures here. Lets see what a year of good focus can do. 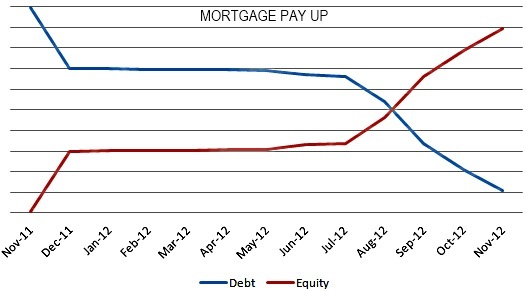 As you may see, the debt graph is heading south. Its almost a year since the first pay up drive. It looks like we may just win this battle in less than 2 years. Something tells me we will be 100% debt free in 18 months. It will be exciting to drop the line "we are debt free except for our home loan". Or the one that goes, "we only owe a little on the house". Next year this time, I might be saying, "we owe no one, no one at all". We already own far more equity than we owe at 66% equity. And it feels great. Our home is modest. Every room is used optimally. We even switch main bedroom with the guest bedroom every few months, depending on the season and our mood. We are driving old cars. Mine is 5 years old and will probably push for another few years. This means that we have no car payments. That should be some R10,000 to R15,000 savings which would probably be installment for two cars. That's judging by the installments for the middle class kind of lower cost cars. This is our only debt. Almost all our excess funds are paid into this bond account, including the R15,000 I mentioned in the previous point. We took part of our savings/ investments to pay into the home loan. It was so painful doing so but I can now see that sacrifice paying off. The home loan costs us 6.9% per annum whilst the savings earned us a mere 4.65%. We should have done this way earlier. We pushed our rental property mortgages and managed to pay them up, freeing more cash to pay to the house. We dont allow ourselves to create any kind of debt. It doesnt matter how much bonus points we are promised. Debt is just that...DEBT. We are not frugal, but we don't overspend on unnecessary stuff either. One most important point is that...we are way too excited. This whole adrenaline drive keeps us way too excited. 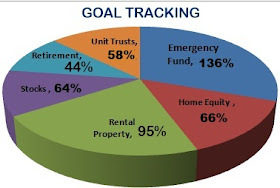 The thought of not having a bond account as a monthly expense keeps us stuck on the goal. We are already planning on what we will do after the last payment. I can recommend this to anyone, really. Try paying up debt to feel how I'm feeling right now. Its an amazing feeling. I think we will have to go on a week long Africa Safari holiday or by the beach after killing this debt. I would love to hear from you. What financial goal have you set for yourself lately?